Since the 1880’s, Cooperative Extension offices have had measurable impact on the yield and taste of many fruits. New varieties of apples, pears, cherries, peaches and plums doubled and yields increased many times over. At the same time, growers learned grafted trees reach maturity and bear the same size fruit sooner than conventional varieties. The story of new fruits and improved varieties is exemplified no better than by the story of the blueberry. Blueberries were indeed wild until around 1940 when the lifetime work of one breeder, Miss Lizzie as she was known locally in New Jersey, paid off with fruit four times the size of wild berries. Elizabeth Coleman White, daughter of a commercial cranberry grower, researched blueberries with Dr. Frederick Coville, a botanist with the USDA. By 1937, they had developed eight varieties from wild selection and fifteen improved varieties. Today, growers persist in developing cultivars with bigger berries, earlier fruiting times, and hardier bushes. Blueberries are members of the Ericaceae family which also includes rhododendrons, azalea, cranberries and huckleberries. Belonging to the genus Vaccinium, from the Latin “vacca” for cow because cows love the berries, there are three main types of blueberries grown in the United States; the high-bush, the low- bush and the rabbit-eye. They are, to some extent, self-pollinating but bumblebees and wind help them along. All blueberry plants will cross-pollinate with each other. Having cross-pollinated, the fruit tends to be larger. The high-bush blueberry, Vaccinium corymbosum, is a vigorous plant which grows successfully in our Marin coastal climate. Rabbit-eye blueberries, Vaccinium ashei, are also high-bush cultivars that are drought tolerant but not as winter hardy as V. corymbosum. The low-bush blueberry, Vaccinium augustifolium, is native to northeastern United States and Canada. This blueberry bush, only about 18 inches tall, is an underground stem spreader and very cold hardy. During the growing season, the production of berries occurs over time and accordingly, the berries are classified as early, midseason and late producers. The blueberry plant begins to bear at about three years and continues for up to forty years. While ripening fruit turns blue, the fruit is only ready to eat one to two weeks later when the berry twists off the stem easily and tastes sweet. In our San Rafael garden in the fall of 2002, we planted seven varieties of high-bush including ‘Early Blue’, ‘Oneal’, ‘Misty’, ‘Blue Ray’, ‘Berkeley’, ‘Georgia Gem’, and ‘Jersey’. They are listed pretty much in order of seasonal ripening and with 37 bushes, in our sunny San Rafael location, produce a yield of about four to ten cups of berries per week from May through July. Blueberries may be planted from fall through early spring. Blueberries have shallow roots that don’t like to be disturbed. Adding a layer of pine needle mulch helps suppress weeds and maintain correct pH levels. Remember, the plants are acid lovers. A thrifty way to add an acidifying agent is to incorporate your coffee grounds and tea leaves into the soil around the blueberry plants. Birds are likely to be your biggest pest. We chose to plant enough to share. Insect pests seem to be infrequent but may include aphids, orange tortrix caterpillars that feed on leaves but does little damage, root weevils that may stunt the plant and thrips that feed on the developing fruit leaving a scar. Diseases are also few including Botrytis twig and blossom blight which causes a gray mold fungus. Wet weather can bring this on and can be controlled by spraying during wet weather with a copper fungicide every 10 days from petal fall. Phytophthora root rot can occur with overwatering or poor drainage. 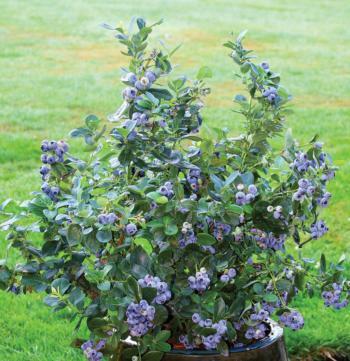 Accordingly, blueberries are happy planted on slopes, in containers and raised beds which help improve drainage. To plant a blueberry, dig a hole one foot deep and twice as wide. Keeping the plant high, spread the roots in all directions and cover them with a couple of inches of soil. Water thoroughly and mulch. About a month after planting, apply a 10-10-10 fertilizer, about one and a half tablespoons per plant. If you prefer organic-based fertilizers, apply one pound of fish or blood meal per plant. Blueberries are heavy feeders and like an application of fertilizer in early spring. Continue feeding every two months until berry season is complete. Watering is most important when the berries begin to swell. Apply one inch of water per week. For drip systems, this is about 1.25 gallons per week. We have watered four to five times per week during warm weather. Regarding pruning, do it if you want production of large berries. Remember the fruit is produced on one year old wood. Prune twiggy, spindly older wood, keeping the bush open. You can tell the difference between a fruit bud and a vegetative bud by their fatter, less pointed appearance. Growers recommend limiting the number of canes to 6 to 8 per bush. In our garden where the bushes form a hedge, we have not limited the number of canes. We simply use the smaller berries in blueberry muffins or jams. As we appreciate limited resources including space and water, why not plant blueberries this fall as a hedge in your garden? You can plant them as close as two and half to three feet apart. Edible landscaping can be rewarding visually as well as palate wise. Blueberries have lovely, glossy green foliage that turns scarlet and yellow in the fall. In spring, clusters of small white flowers turn to berries from May through July. They are kind in another sustainable way; requiring little pruning. Remember, homegrown is always tastier and blueberries are loaded with powerful disease fighting antioxidants. And, if anyone asks what makes a blueberry blue, tell them it’s the water soluble pigment, anthocyanin, found in the skin of the berry.